کانسار مس- روی- سرب پیرقشلاق در پهنه ی ایران مرکزی، در استان زنجان و در شمال خاور شهرستان ماهنشان واقع شده است. سازند کهر با سن پرکامبرین به عنوان قدیمی ترین واحد منطقه به شمار می رود که توسط مجموعه ای از دایک های گرانیتی قطع شده است. کانه زایی مس- روی- سرب پیرقشلاق عمدتاً به صورت صفحه ای شکل بوده و در درون واحدهای ماسه سنگ دگرگون شده، متاتوف آندزیتی، متاکریستال لیتیک توف و متاآندزیت روی داده است. بر اساس مطالعات صحرایی و میکروسکوپی، کالکوپیریت، پیریت، اسفالریت، گالن، آرسنوپیریت و به مقدار کم مگنتیت کانی های اصلی کانسنگ را تشکیل می دهند. بافت ماده ی معدنی از نوع دانه پراکنده، لامینه ای، توده ای و رگچه ای است که بافت رگچه ای عمدتاً در بخش های زیرین کانسار دیده می شود. کانی های ثانویه از جمله اسمیت زونیت، سروزیت، کالکوسیت، کوولیت، مالاکیت، آزوریت، گوتیت و لپیدوکروسیت نیز در اثر فرایندهای سوپرژن در این کانسار تشکیل شده اند. دگرسانی های سیلیسی، سریسیتی، کلریتی و کربناتی دگرسانی های اصلی کانسار پیرقشلاق را تشکیل می دهند. نتایج مطالعات انجام شده نشان می دهد که کانه زایی مس- روی- سرب در کانسار پیرقشلاق از نوع کانسارهای سولفید توده ای آتشفشان زاد تیپ بشی است. Pirgheshlagh Cu-Zn-Pb deposit is located in the Central Iranian zone, north-east of the Mahneshan in the Zanjan province. The Kahar Formation with Precambrian age is the oldest Formation in the area which cutted by the granitic dykes. The Pirgheshlagh Cu-Zn-Pb mineralization occurred mainly as tabular-shape within the metamorphosed sandstones, meta-andesitic tuff, meta-crystal lithic tuff and meta-andesite rocks. Based on the field and microscopic studies, the main minerals consist of chalcopyrite, sphalerite, galena, pyrite, arsenopyrite and minor magnetite. The ore textures consist of disseminated, laminated, massive and veinlet which the veinlet texture is occurred mainly in the lower part of deposit. Secondary minerals such as smithsonite, cerrusite, chalcocite, covellite, malachite, azurite, goethite and lepidochrosite have formed during supergene processes. The main alterations in the Pirgheshlagh deposit include silicic, sericitic, chlorite and carbonate. The results of this study suggest that the Cu-Zn-Pb mineralization in the Pirgheshlagh deposit is a Besshi-type valcogenic massive sulfide (VMS) mineralization. ابراهیمی، م. ح.، آفتابی، ع. و محمدی­ نیایی، ر.، 1390- ویژگی­های ساختی، بافتی، کانی­شناسی و ژئوشیمیایی و الگوی تشکیل کانسار انگوران در مثلث کانسارهای نوع متصاعدی- رسوبی (Sedex)، سولفید توده­ای (VMS) و دره می­سی­سی­پی (MVT)، پترولوژی، شماره 3، صص. 1 تا 10. آقانباتی، س. ع.، 1383- زمین­شناسی ایران، انتشارات سازمان زمین­شناسی و اکتشافات معدنی کشور، تهران، ایران، 586 ص. 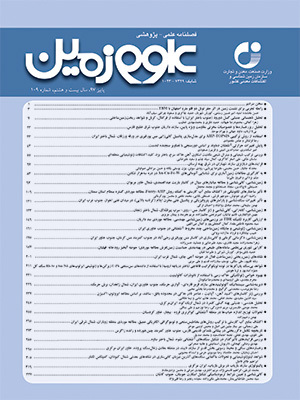 بیگدلی، ز.، 1393- کانی­شناسی و ژئوشیمی سنگ میزبان و کانسنگ مس در منطقه چهرآباد، شمال­خاور ماهنشان، پایان­نامه کارشناسی ارشد، دانشگاه زنجان، زنجان، ایران، 107 ص. بیگدلی، ز.، ابراهیمی، م.، نباتیان، ق. و مختاری، م.، 1393- کانی­شناسی، ساخت و بافت ماده معدنی در کانسار مس رسوبی چهرآباد، شمال­ باختر زنجان، بیست و یکمین همایش بلورشناسی و کانی­شناسی ایران، دانشگاه سیستان و بلوچستان، صص 1 تا 6. ذوالفقاری، م.، 1395- زمین­شناسی، کانی­شناسی، ساخت و بافت، ژئوشیمی و ژنز کانسار سرب و روی پیرقشلاق، شمال ماهنشان، پایان­نامه کارشناسی ارشد زمین­شناسی اقتصادی، دانشگاه زنجان، زنجان، ایران، 223 ص. شرکت معدنکاران انگوران، 1384- گزارش اکتشافی کانسار روی- سرب پیرقشلاق، 112 ص. شیرخانی، م.، قادری، م. و رشیدنژاد عمران، ن.، 1385- کانه­زایی پلی­متال گرمابی در کانسار آی­قلعه­سی، جنوب­ خاور تکاب، دهمین همایش انجمن زمین­شناسی ایران، صص. 501 تا 508. قدیمی، س. و نباتیان، ق.، 1393- بررسی زمین­شناسی معدن روی- سرب انگوران و اثرات فعالیت­های معدن­کاری بر آلودگی منطقه، مجله زمین­شناسی کاربردی پیشرفته، شماره 12، صص. 56 تا 66. کرمی، م.، ابراهیمی، م. و کوهستانی، ح.، 1392- مطالعات سنگ­نگاری و ریزساختاری مرتبط با دگرشکلی شکل­پذیر در منطقه لولک‏آباد، خاور ماهنشان، سی و دومین گردهمایی و نخستین کنگره بین‎المللی تخصصی علوم زمین، مشهد، چکیده مقاله، 495 ص. کریمی، م. و لطفی، م.، 1390- ژئوشیمی و خاستگاه زمین­ساختی سنگ­های آتشفشانی محدوده معدن بایچه­باغ (زنجان)، فصلنامه زمین­شناسی کاربردی، شماره 3، صص. 255 تا 268. لطفی، م.، 1380- نقشه زمین­شناسی ماهنشان با مقیاس 1:100000، سازمان زمین­شناسی و اکتشافات معدنی کشور، تهران، ایران. محمدی نیایی، ر.، 1394- ژنز و زمین­شناسی اقتصادی کانسار سرب و روی آی­قلعه­سی با نگرش ویژه­ای بر کانه­زایی فلزات قیمتی، رساله دکترا، دانشگاه آزاد اسلامی واحد علوم وتحقیقات تهران، تهران، ایران، 211 ص. محمدی نیایی، ر.، 1395- گسلش فرایندی پویا در تکوین نهشته­های سولفیدی و ناسولفیدی کانسار انگوران، هشتمین همایش انجمن زمین­شناسی اقتصادی ایران، زنجان، صص. 292 تا 299. Alavi, M., 1994- Tectonics of the Zagros orogenic belt of Iran. New data and interpretations. Tectonophysics, V. 229, p. 211-238. Alinia, F., 1989- Mineralogy and genesis of Zn–Pb deposit, Angouran, northwest Iran. Abstracts of the 28th International Geologica Congress, Washington, DC, (abstract 28/1), p. 31. Annels, A. E., O’Donovan, G. and Bowles, M., 2003- New ideas concerning the genesis of the Angouran Zn–Pb deposit, NW Iran. Abstracts of the 26th Mineral Deposits Studies Group, University of Leicester, Leicester, p. 11–12. Daliran, F. and Borg, G., 2005- Characterisation of the nonsolfide zinc ore at Angoran, northwestern Iran, and its (genetic) aspects. In: Jingwen, M. and Bierlein, F. P. (Eds. ), Mineral deposit research: meting the global change. Springer, Berlin Heidelberg, New York, V. 2, p. 91 912-916. Dawson, G. L., Caessa, P., Alverca, R. and Sousa, J. C., 2001- Geology of the Aljustrel Mine area, southern Portugal. In: GEODE Workshop “Massive sulfide deposits in the Iberian Pyrite Belt: New advances and comparisons with equivalent systems”. Aracena, Spain, Aljustrel, Eurozinc, Aljustrel Field Trip Guidebook, 28 p.
Etemad-Saeed, N., Hosseini-Barzi, M., Adabi, M. H., Sadeghi, A. and Houshmandzadeh, A., 2015- Provenance of Neoproterozoic sedimentary basement of northern Iran, Kahar Formation. Journal of African Earth Sciences, V. 111, p. 54-75. Fox, J. S., 1984- Besshi- type volcanogenic sulphide deposits- a review. Canada Inst, Mining Metallurgy Bulletin, V. 77(864), p. 57-68. Franklin, J. M., Gibson, H. L., Galley, A. G. and Jonasson, I. R., 2005- Volcanogenic Massive Sulfide Deposits. In: Hedenquist, J. W., Thompson, J. F. H., Goldfarb, R. J. and Richards, J. P.)eds. (Economic Geology 100th Anniversary Volume, Littleton, CO, Society of Economic Geologists, p. 523-560. Galley, A. G., Hannington, M. D. and Jonasson, I. R., 2007- Volcanogenic massive sulphide deposits. In: Goodfellow, W. D., (ed. ), Mineral Deposits of Canada: A Synthesis of Major Deposit-Types, District Metallogeny, the Evolution of Geological Provinces, and Exploration Methods. Geological Association of Canada, Mineral Deposits Division, Special Publication No. 5, p. 141-161. Gilg, H. A., Boni, M., Balassone, G., Allen, C. R., Banks, D. and Moore, F., 2006- Marble-hosted sulphide ores in the Angouran Zn–(Pb–Ag) deposit, NW Iran: interaction of sedimentary brines with a metamorphic core complex. Mineralium Deposita, V. 41, p. 1–16. Goodfellow, W. D. and McCutcheon, S. R., 2003- Geologic and genetic of volcanic- hosted massive sulphide deposit of the Bathurst mining camp. Northern New Brunswick Economic geology Monograph 11, p. 245-311. Honarmand, M., Xian-Hua Li, Nabatian, Gh., Rezaeian, M. and Etemad-Saeed, N., 2016- Neoproterozoic–early Cambrian tectono-magmatic evolution of the Central Iranian terrane, northern margin of Gondwana: Constraints from detrital zircon U–Pb and Hf-O isotope studies. Gondwana Research, V. 37, p. 285–300. Klemd, R., Maiden, K. J. and Okrusch, M., 1989- The Machless copper deposit, south west Africa/Namibia. a deformed and metamorphosed massive sulphide deposit. Economic Geology, V. 82, p. 587-599. Large, R. R., 1992- Australian volcania- hosted Massive Sulphide Deposits. Features, Styles, and Genetic Models. Economic Geology, V. 87, p. 471-510. Mohamadi Niaei, R., Daliran, F., Nezafati, N., Ghorbani, M., Sheikh Zakariaei, J. and Kouhestani H., 2015- The Ay Qalasi deposit: An epithermal Pb-Zn (Ag) Mineralization in the Urumieh- Dokhtar volcanic bellt of notthwestern Iran. Neues Jahrbuch für Mineralogie–Abhandlungen, V. 192, p. 263-274. Ohmoto, H. and Skinner, B. J., 1983- The Kuroko and related volcanogcnic massive sulfide deposits. Economic Geology Monograph 5, 604 p.
Shahabpour, J., 2005- Tectonic evolution of the orogenic belt in the region located between Kerman and Neyrez. Journal of Asian Earth Sciences, V. 24, p. 405-417. Solomon, M., Tornos, F. and Gaspar, O. C., 2002- Explanation for many of the unusual features of the massive sulfide deposits of the Iberian pyrite belt. Geology, V. 30, p. 87-90. Tornos, F., 2006- Environment of formation and styles of volcanogenic massive sulfides: The Iberian Pyrite Belt. Ore Geology Reviews, V. 28p. 259-30. Vikentiev, I. V., Shikikumba, T. H., Karpukhina, V. S., Nosik, L. P. and Kerzin, A. L., 2008- Formation condition of the Otjihase massive sulfide deposit in the Matchless amphibolite belt (Namibia): Proceedings of the XIII All-Russian Conference on Thermobarochemistry, IGEM Russian Academy of Sciences, p. 19–22 (in Russian). Wilson, D., 2000- Besshi-type VMS deposits (part I and II), U.S. Geol. Survey open – file Report.